Welcome, Winifred, the Denver Zoo's Newest Addition! The adorable lesser kudu made her debut on February 5! Cuteness overload! 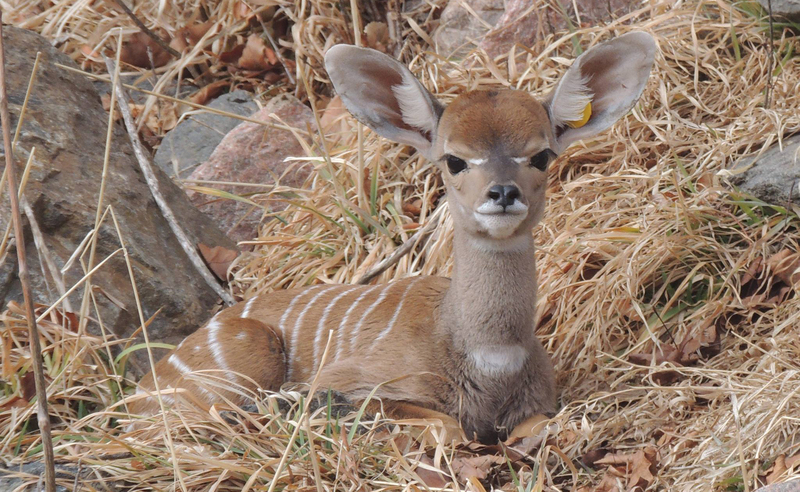 Say hello to Winifred, the newest member of the Denver Zoo's lesser kudu herd! She was born earlier in the month and has joined her large family in the Central Ranges habitat. "Named after her grandpa, Fred, this little bundle of joy was born on February 5 and joins mom, Moscato; grandma, Dakarai; and dad, Joe! Come say hello to Winifred next time you visit!" says the zoo on its Facebook page. Near-threatened in the wild, lesser kudu can be found in grassy, semi-arid areas of northeastern Africa, in particular, Ethiopia, Kenya, Somalia, South Sudan, and more. It has already gone extinct in Djibouti. These animals love to feed on foliage from bushes and trees, as well as herbs. In the wild, the lesser kudu is mainly active at night and during the dawn, and it seeks shelter in dense thickets just after the sunrise. This little bundle of joy's namesake, Fred, passed away last April. At 15 years old, he was the oldest male of his species, and second oldest overall, in accredited North American zoos. Fred came to Denver Zoo in July 2009. He fathered seven calves with two mates at Denver Zoo. Winifred's mom, Moscato, who is around 4 years old. You can see this little one as she plays around in the Central Ranges habitat at the Denver Zoo. If it's your birthday coming up, you can get into the zoo for free on your big day, if you register for a Denver Zoo account first. Make sure you say hi to Winifred! The Denver Zoo is constructing a new state-of-the-art animal hospital!